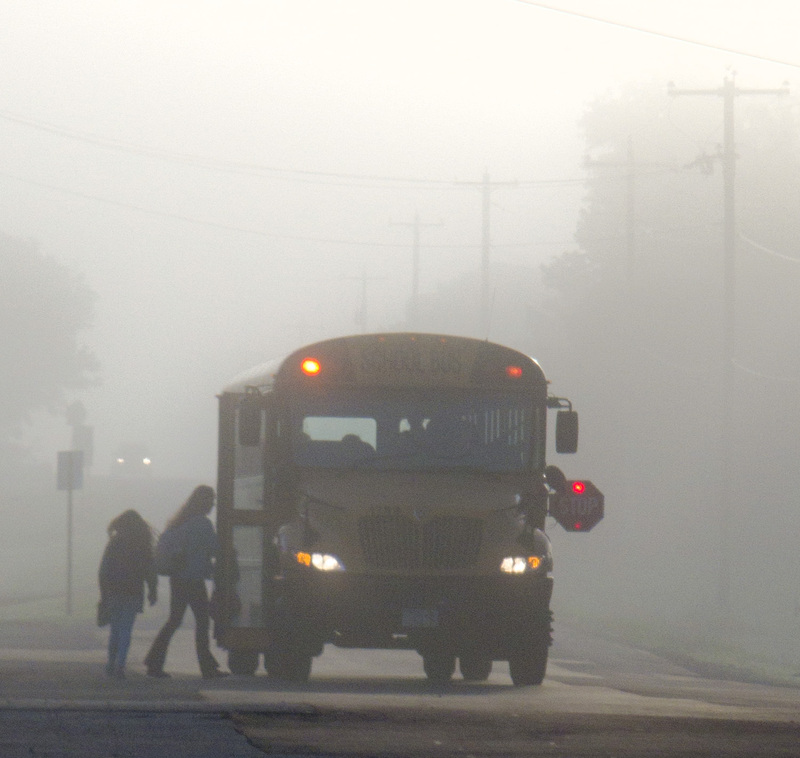 Hmm, standing in wet grass, during a fog, and snapping children and school buses. Anyone other than teacher and you’d be arrested. And running onto the middle of the road in fog to get a photo? You know, I did think about that–this isn’t my old school and no one knows me, so I waved–a lot!- to all the bus drivers. I will say that this is one case where being a woman probably removes the freaky factor. And you wonder why you have an ear infection? I really like the last shot. Remember–you have promised me fog for our October shoot. Having been a school bus driver while I was going to college I can really identify with these shots. 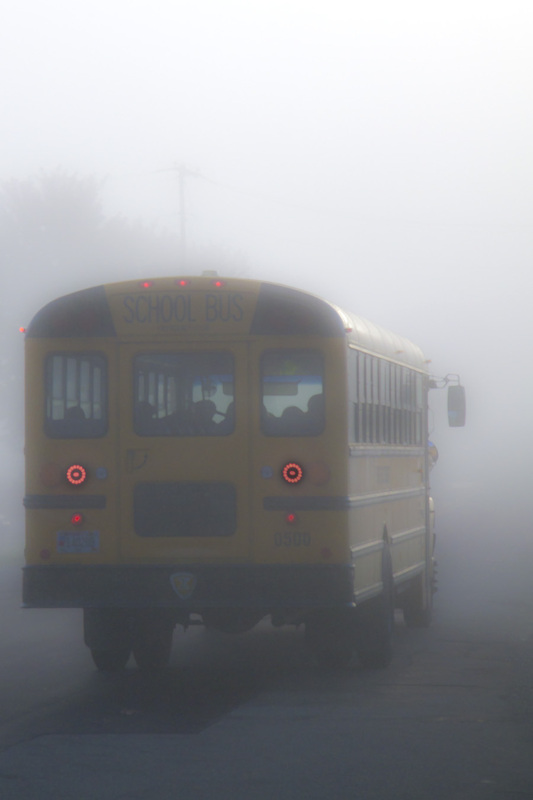 I can tell you that as much as fog or snow disturb me as a driver, I would be…literally…unable to shoulder the responsibility of getting kids through that safely every day. You’ve painted such a cool image of you, your bus, snow banks and the small person with words…you need to take up painting with brushes and put that on canvas. I spent a lot of years with a paintbrush, trying to slap the canvas into submission. And while I have a fan or two, for the most part it didn’t bring me the satisfaction that photography does. Giving up painting left me with photography and songwriting, and that’s been more than enough to keep my creative urges in line. You are pretty handy with the words yourself………do I ask you to paint? love the lights in the third shot…doing just what they are suppose to do….looking precisely like they don’t belong The play of the cool vigilant calculated functional elements outside vs. the warm waking random casual environment inside is high drama but so ordinary that it’s almost never seen. It is after all an extraordinary execution – one that Richard ( comment above) so aptly stated. Thank you, Pépé le Moko. (Where have you been?) I really really like your description of the exterior versus interior functions. The trio of buses are full of kids and parked behind Holy Mother of Pearl on the corner, waiting for a teacher to come out and shepherd the kids into school. While they have delivered the kids safely, they still aren’t going to turn their charges loose until that guardian steps out of the school. Yes to Pepe’s comments…profound. As for your “ideal photo” there is something quintessential about the way you’ve captured “off to school”. What I’m also getting is the sense of a kind of portal to something beyond. I like the picture with the girls–it’s straight-forward “off to school” as you said. But the last one? 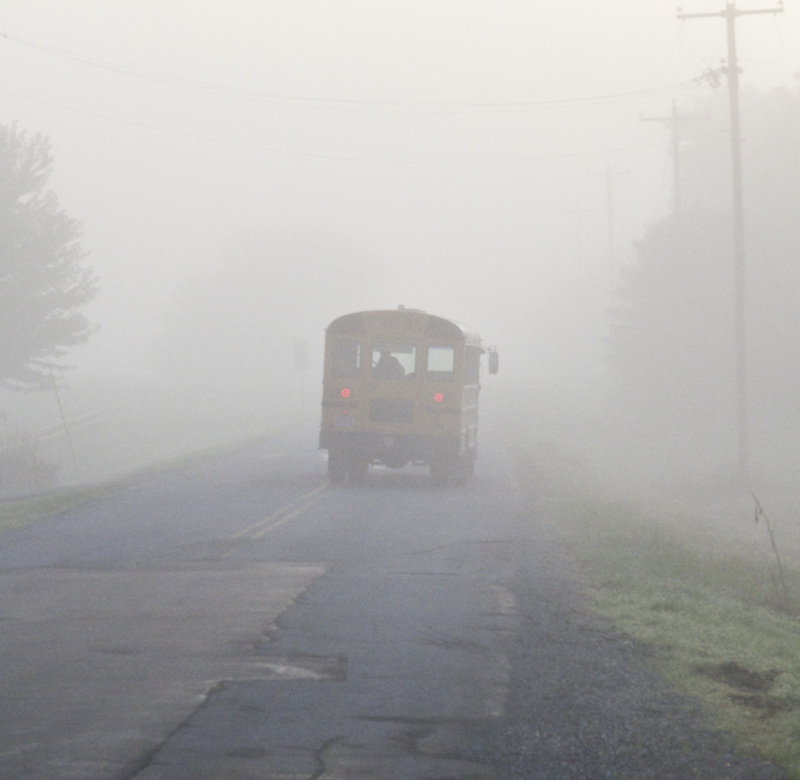 I’ve never put my child on a bus and watched it disappear into the fog. It feels like huge statement about faith in both the bus driver and the universe! Yeah! I can see your pictures again. Text came through in China but all pics were non -existent. I also was going to praise #3. We had this fog at the Great Wall. Wish it had lights. Glad you are back all safe, sound and tired. Love the last picture — it is so Wisconsin. The patches in the road and the green grass drying up next to it with the yellow bus on its way with our bright young kids on board. I always wanted to ride a yellow bus to school and never had the opportunity — so as a youngin, I just watched as they took the public school kids to school and how lucky they were to have a place on the yellow bus!! Oh, Kathie–how could I add to what you just said? Thank you–I’m so glad that you enjoy the shot.